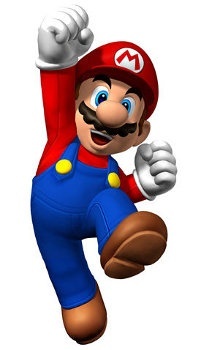 Tim Gunn, fashion guru of Project Runway, is glad that he doesn't have to wear Mario's clothes. When you think of videogames, the name Tim Gunn doesn't really float to the surface. I would not blame you if you've never heard of him, and the only reason I know who Tim Gunn is because I live with a woman with penchant for reality television. Project Runway is one of the better shows out there, showcasing aspiring fashion designers who usually have actual talent, and Tim Gunn is one of the show's hosts who offers advice and encouragement to the contestants. Understandably, Gunn's knowledge of videogames is minimal so when he was presented with a picture of Mario, however, he was flummoxed. "Well," he said after a long pause. "I'm glad I don't have to wear the Super Mario outfit, I will say that. Overalls are always a challenge. And with the red top and the work boots, he looks like, well, he looks like what he really is." Which is what exactly? An Italian plumber? "Yeah. Sorry, I mean that only in the nicest way to plumbers everywhere. Though, I think its hard to take service clothes and make them fashionable. I think it's very difficult," Gunn continued. "And frankly they're service clothes [that Mario is wearing] and functioning, performance comes first and in that regard, Super Mario is dressed appropriately, he's Super Mario. I'm just glad I don't have to wear this."